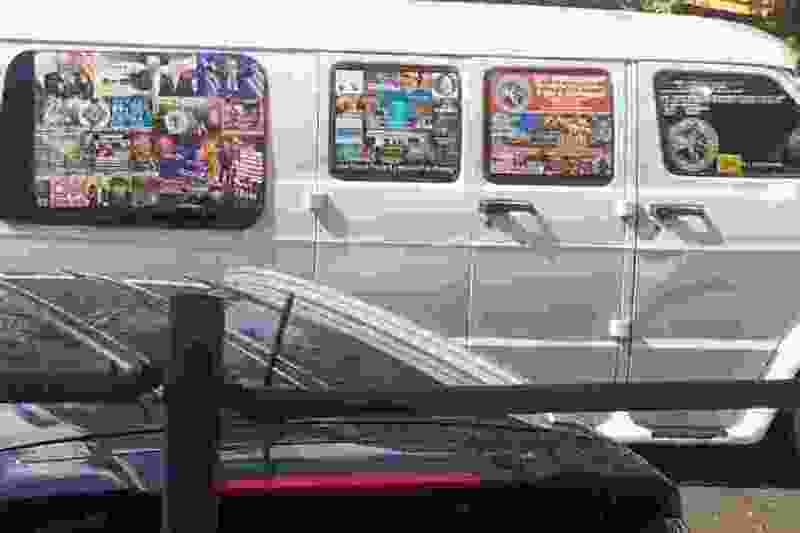 (Lesley Abravanel | The Associated Press) This Nov. 1, 2017, photo shows a van with windows covered with an assortment of stickers in Well, Fla. Federal authorities took Cesar Sayoc into custody on Friday, Oct. 26, 2018, and confiscated his van, which appears to be the same one, at an auto parts store in Plantation, Fla., in connection with the mail-bomb scare that has targeted prominent Democrats from coast to coast. The downfall of our democracy is imminent. It may not happen today or tomorrow, and it won’t be an event, but rather a slow and steady decline into a morass of intolerance and irrational fear, until hatred and distrust of our countrymen become the norm. When Americans send pipe bombs to their fellow citizens just for having a difference of opinion, can total anarchy be far behind? When the supposed leader of the free world condones violence and contempt, the nobler principles of freedom and equality will surely perish. I look at what is happening in our once-great country and all I can see is rancor, division and discontent, all promulgated by a myopic, moronic miscreant. Not a leader, but an agitator. Not a peacemaker, but a warmonger, a whoremonger and a disciple of all that is wrong and unholy, motivated by a quest for power and a lust for greed. All the world’s great empires crumbled, most after only a few hundred years of prominence. At 242 years as a shining city on a hill, the United States of America will eventually meet her demise at the hands of corrupt and conspiring men who have forsaken the righteous ideals of our founding fathers in exchange for unrighteous dominion and the adulation of a gullible and feeble-minded proletariat. If we don’t stand up for our rights while we can, we will forfeit them forever.